Our chapel is a hidden treasure. Found on the third floor of Oxford House, the Chapel is our best preserved example of Oxford House’s beginning as a Christian orientated Settlement. The space is an excellent illustration of Neo-Jacobean architecture with a smart wooden screen at the entrance, wooden panelled walls and floors, and a high arched ceiling. At the back of the chapel is a beautiful painting of the Crucifixion by Alfred Soord, dated 1914, and hidden by wooden panels until opened up. 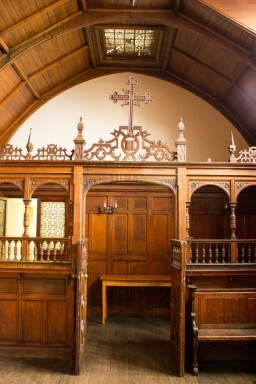 The chapel was built with the purpose of holding services for the resident graduates, gaining experience in being a part of the clergy in later life. These services were extended to the public too, although it is noted that, while regular, the attendance was small and not a requirement of community life at Oxford House. Later on, choirs and performance arts took the place of the c hurch services, until recent leaks forced the Chapel to close to the public. Today, the chapel is in a much worsened state . 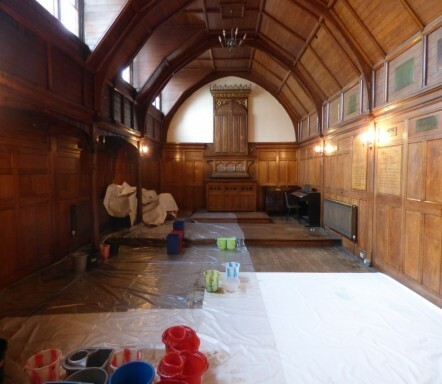 The roof requires major renovation to patch up the many water leaks, and we are concerned that if it continues, the original woodwork, flooring and the painting will be irreversibly damaged. Due to our roof leaks, Oxford House has been placed on the Buildings at Risk register by Historic England, alongside four other buildings in Bethnal Green. Our capital works on the building are due to begin in the following year, but until then, our hidden gem remains closed to the public. To donate and help us restore the Chapel to its former glory, please head to our donation page and be a part of our Heritage Project. All images are credited to Oxford House.